We offer basic, comfortable living and research facilities and access to a diverse array of potential study sites. Also, BFREE maintains a number of scientific resources, including the Rainforest Science Lab, the Dora Weyer Natural History Library, the Hicatee Conservation and Research Center, reference biological collections, equipment, and daily onsite weather measurements since 1997. The Lab offers researchers access to scientific equipment, bench space, refrigeration, as well as storage. The Lab is a joint effort between BFREE and Lincoln Memorial University. The laboratory was completed in 2011, but is an ongoing project as we further develop our capacity for research and environmental education. Currently, the 20’ X 20’ laboratory is self-contained having bench space with dissecting and compound microscopes with CCD cameras. The Hicatee Conservation and Research Center (HCRC) consists of two large breeding ponds and associated infrastructure to support the captive breeding program for the critically endangered turtles. 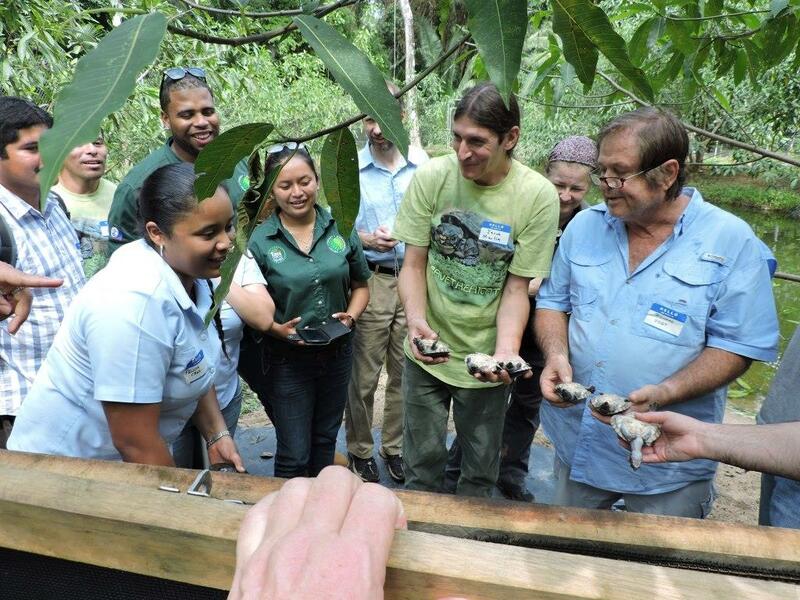 The hope is that captive hatched turtles should be available to restock depleted wild populations, create new populations, and at the same time take pressure off of wild populations by developing sustainable methods for farming Hicatee that can be implemented easily throughout Belize and the entirety of their range. In 2016, the Hicatee Forum brought together stakeholders from throughout Belize and Guatemala to discuss issues related to the critically endangered river turtle. 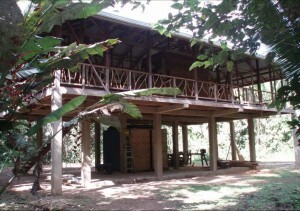 This architecturally unique, elevated thatched roof structure is our gateway to the outside world. A fixed cellular telephone is available in a booth under the satellite station to give you voice communication to the world. 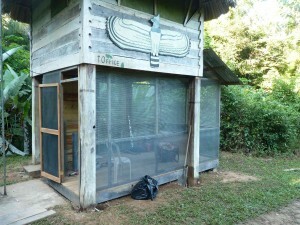 This building also provides much needed office space for BFREE staff. 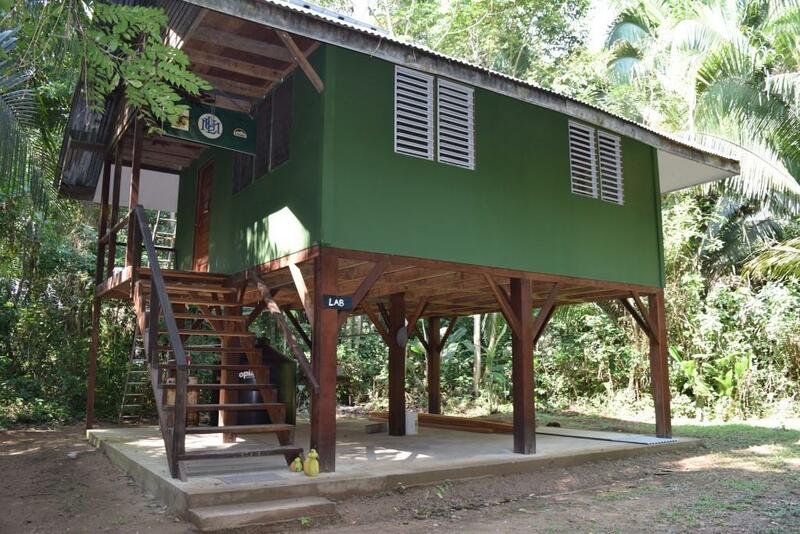 Named in honor of one of Belize’s pioneer conservationists, BFREE’s steadily expanding, (multi-media) library is particularly strong in tropical forest and plant ecology, Belizean natural history, and herpetology. Some of the printed resources are also available through our online library. The library also contains a very comprehensive collection of laminated herbarium specimens from BNR, with over 500 specimens catalogued. This creatively designed structure houses the BFREE herbarium collection, botanical library, field equipment storage, and is the private residence of BFREE plant ecologist Dr. Steven Brewer. The Botany House was constructed with wood from downed trees as a result of Hurricane Iris. BFREE stores a hodgepodge of basic research and mechanical equipment that may be borrowed or rented by visiting students and researchers, depending on the intended use and duration. Of course, other demands exist, and field use is hard on equipment, therefore not all items below are available at all times. In general, if a piece of equipment is crucial to your research, you should count on bringing your own. Bring two, for that matter, and consider making a material donation to BFREE when your research is inactive or concluded! 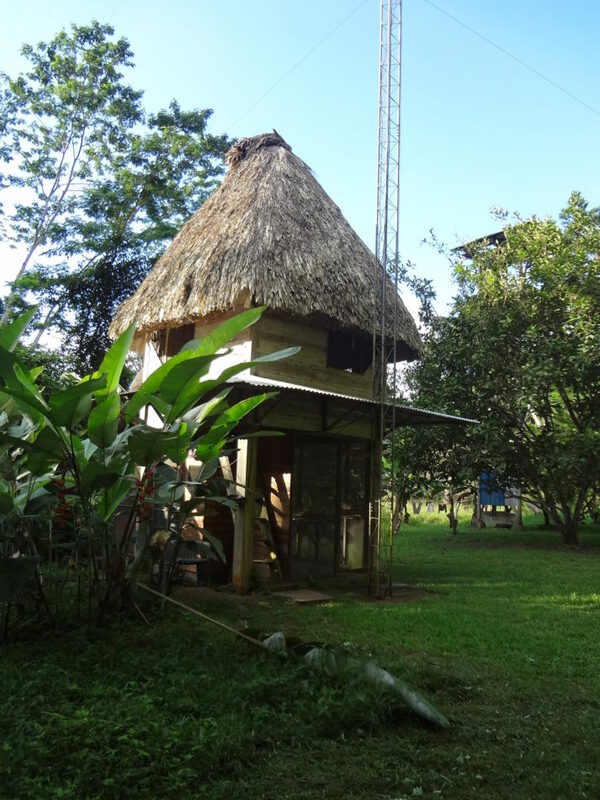 Research and Environmental Education (BFREE) is a conservation organization which operates a field station in the rainforest of Southern Belize. © 2019 Belize Foundation for Research and Environmental Education All Rights Reserved.